I volunteer my time teaching advanced yoga breathing and meditation to help stressed and traumatized people regain energy, good sleep, peace of mind and to detoxify their bodies and regain harmony in their lives. This work integrates mind-body-spirit techniques from the yoga and martial arts I teach. (I may also suggest herbs, nutrients, and medicines). To be able to transform so many peoples' lives in a short workshop is a special privilege and a blessing for me. 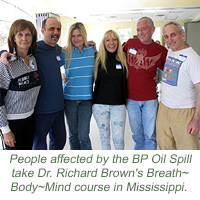 Research has shown that the extraordinary breathing techniques taught in the workshop effectively relieves stress and increases energy, awareness, mental focus and sense of belonging. The effects have been demonstrated in a wide range of populations including health care practitioners, individuals with psychiatric and medical conditions, children and adolescents, prison inmates and staff, juvenile offenders, and victims of natural disasters, poverty, violence, war, and terrorism. 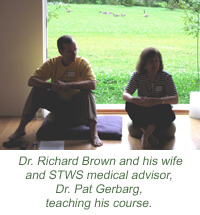 Many of my patients who have taken the workshop say they have been transformed, and that they never would have imagined that something so simple would have been so powerful and helpful. I especially enjoy helping 9/11 responders and military veterans to recover their lives. You can also find out more about my work by visiting my web site www.breath-body-mind.com.